For most politically-engaged Houstonians, the first week of November was focused primarily on the big 2014 election held on Tuesday the 4th. That is when we got to decide the future of the state by electing a Governor, Senator, Lieutenant Governor and legislature. It was a pivotal day for state of Texas, including Houston. However, few may guess the political importance that happened just days before that big election… events which started in the Bayou City, but could end up proving significant at the national level. November 2nd, now known as I Stand Sunday, marks a very important turning point for the Houston Area Pastor Council. Houstonians probably know this group as those who stood in staunch opposition to the Houston Equal Rights Ordinance, passed earlier this year. The core of the group consisted of 5 area pastors, among them Dave Welch- Executive Director of the council, and Steve Riggle of Grace Community Church. Both especially significant for their long-held opposition to the Parker administration and full-on assault of the LGBT equality movement in any form. Thanks to creative use of media attention, it became national news when these same pastors received subpoenas for the political work being done within their churches, and from the pulpit. Although the city has long since withdrawn the actual requests to subpoena any sermons, the national outrage that it sparked was enough to turn these local pastors and their local grievances into a world-wide cause. It was in Riggle’s sanctuary of Grace Community Church where the I Stand Sunday rally was held. But this rally was far more than a gathering of a few in the house of worship. With powerful co-sponsors like the Family Research Council and American Family Association, coverage of I Stand Sunday was viewed by an estimated 1 million people all across the country. It has literally elevated the Houston Pastors and their cause to national prominence. The full I Stand Sunday event can be viewed here. 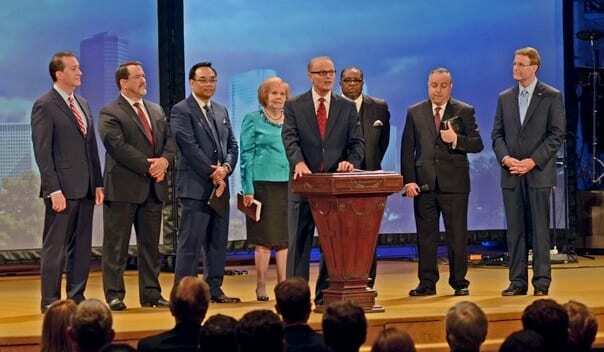 So much so that the Houston Area Pastor Council has now branched out to become the U.S. Pastor Council… a national organization intent on defeating the equality agenda, and upholding their said religious beliefs. Aided by the likes of Tony Perkins, Phil Robertson, Mike Huckabee and others, what was once little more than a dream by Welch and his close confidants has now become a reality. In 2014, the organization has expanded to a membership of over 700 pastors across the nation, with ready access to the financial and voting power of their congregants. Indeed, the U.S. Pastor Council is well on it’s way to becoming the nation’s most powerful hate group. Texas Leftist has not chosen to post things like the I Stand Sunday video for promotional purposes. However, it is critically important for those that support the equality movement in Houston and beyond to know what we are up against. If the Houston Equal Rights Ordinance is forced to a ballot, the full weight of the U.S. Pastor Council, FRC and other anti-equality groups will turn their focus to the Bayou City at a level none of us could anticipate. After I Stand Sunday, this is not the same fight that H.E.R.O. proponents faced back in May to get the law passed.